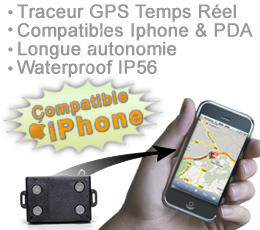 True real-time GPS tracker WITHOUT SUBSCRIPTION whose autonomy is 10 days due to its internal battery. Our GPS beacon THE TR 700 is waterproof and is standard IP56 (Ingress Protection against splash water and dust), equipped with four powerful magnets on the back of our GPS tracker tag, you will have no difficulty with the install on any metallic support, if is not the case you have both sides of our GPS tracker two pins to secure it with a cord or Rilsan, or on its flat side you can put the scratch double sided. 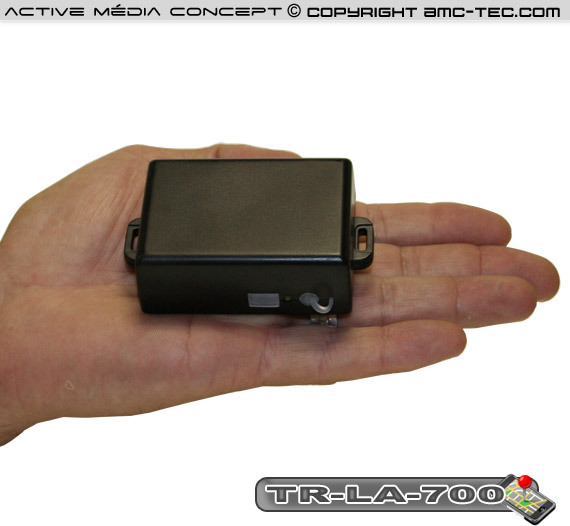 Very easy to use, no software or hardware installation, our beacon real-time GPS works with all type phone or smartphone for iPhone tag your location on a Google Map map example mobile or otherwise. By sending GPS position you have the text display of street address and city is done automatically on your mobile phone via SMS, but also the date and time and the level of battery. 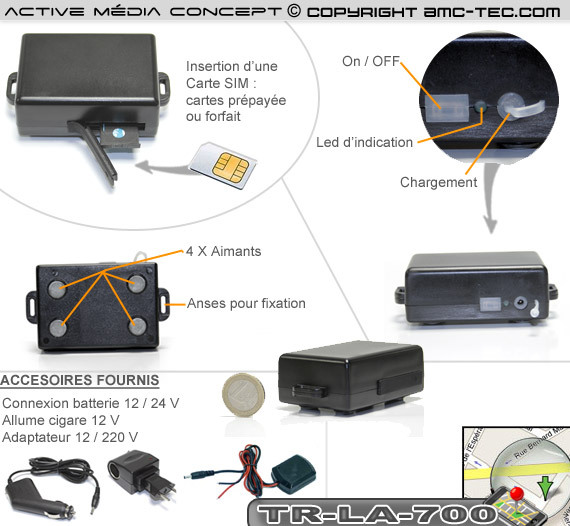 - The detection of shock, vibration, motion: A system for continuous monitoring, the GPS moves, you receive an SMS. - Exceeding geographical said Geofence Alert: Monitoring System preset geographical, area off you receive an SMS. - The Speeding: Continuous surveillance, if the GPS exceeds the preset speed you receive an SMS alert. 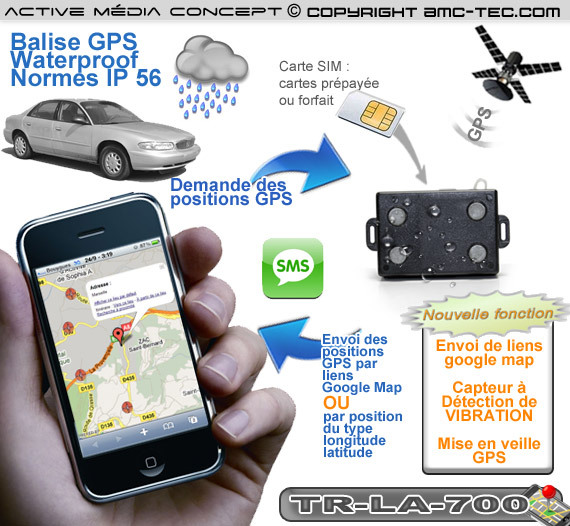 - The tracking mode continuous monitoring and real time: the tracer will pay a preset interval at each location and send an SMS. - There is also an SOS Alert: Press the power button for 6 seconds SOS tracer send an SMS to the three mobile phone numbers discs. Our GPS beacon THE TR 700 positions across Europe and Africa via SMS and GSM Tri Band Handsets only with pre-paid SIM card or phone package. The mapping is free and our tag is under the thumb of 32 satellites for real-time location and accuracy of the tag to 5 meters, when passing through a tunnel under the ground or other GPS tags you communicate the final position and reactive right out to a new position. Thus two modes of localization to be informed on the link or go directly to a map on your mobile phone or information latitude / longitude that you can use on the Internet using a mapping website. Know that through the skills of the company INOV MOBILE, we have combined our beacon has a GPS touch screen that can support up to 8 tags, this portable screen is the NAV-TRACKING V2.se which makes our time tracking system Real unique technology and efficient.